Since the original publication, the "Minkler Mansion" on Main Street in Lyman was sold to the Town of Lyman and it was converted to the new Lyman City Hall in time for both town centennial celebrations to be conducted there in 2009. Chapter 1: updated in 2010 On May 21, 1911, a beautiful sunny Sunday, more than 600 people walked slowly by the casket of Birdsey Dwight Minkler (1849-1911) in the parlor of his mansion on Main Street in Lyman, Washington, only a couple hundred yards from the Skagit River. Just 34 years before, he and his wife floated by there on their way to their new home upriver. The Masonic Lodge in Sedro-Woolley conducted the funeral service at 1 p.m. and Rev. G.A. Landen, a Methodist minister from Bellingham, gave the sermon. The Minkler family stayed inside in seclusion while the largest crowd ever to attend a Skagit County funeral filled the yard outside. After the casket was closed, pallbearers carried it two blocks north to the Knights of Pythias (KP) Hall for another service. Minkler was a Knight from 1889 on, the year that the KP hall was built in Lyman and the same year that Washington territory became the 42nd state. Finally, the pallbearers carried the casket to the new KP cemetery west of town. Only 61 years old, Minkler seemed in excellent health when he left Lyman for the last time earlier that year for an extended trip to his former home in California and a journey to the southern U.S. He returned to Seattle on a late train the evening of May 17 and checked in to the Arlington hotel on First Avenue. He soon went out for a walk up Union Street but when he reached the corner of 4th Avenue he fell to the ground after a massive heart attack and was carried back to the hotel, where he died at 1 a.m. on the 18th. He died without anyone from his large family at his side. His eight children were all home in Skagit County, most of them living in Lyman, and others in Hamilton, Clear Lake, Anacortes or two miles west in the town of Minkler, which was named for the family. Their mother, Hannah Belle Chisholm Minkler, died 18 years before, and his second wife, Christina Nash, died in 1896; she was not mentioned in any of his obituaries. The eldest daughter, Maude Minkler Vanderford, 36, was married to B.S. "Bert" Vanderford, who was a partner with the oldest Minkler boy, John Elburn Minkler, in the family lumber mill in Lyman. At age 35, John was suddenly thrust into family leadership when a wire was sent to Lyman on Thursday morning, summoning him and his younger brother, Garfield Arthur Minkler, age 31, to pick up their father's body at Butterworth & Sons funeral parlors for the long final railroad trip home. The name of Birdsey D. Minkler will ever be associated with those of the sturdy characters who, with unfaltering courage and determination battled with nature in her swamp & forest strongholds, bringing order out of chaos, making fertile the waste places. To such as he the Northwest will ever pay tribute. — Obituary in unknown newspaper. News of Minkler's death hit people throughout Skagit County as hard as it did his family. 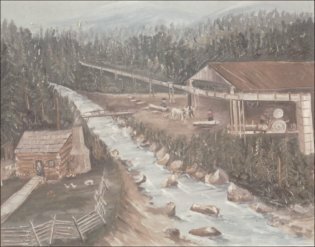 Not only was he one of the first upriver pioneers, but he had amassed a small fortune in the mill business and had substantial investments throughout Skagit County and in Seattle. He was retired but was still active in the mercantile business that Garfield managed in Lyman and just the year before he finished his four-year term in the Washington State Senate. From the time that I grew up nearby in the Utopia district, I heard stories that his Republican Party was grooming him for the governorship, which would have made him the second governor from Skagit County after Henry McBride, from Mount Vernon, who was elected lieutenant governor 15 years earlier and became governor in 1901 upon the death of Gov. John Rogers. Of course that story could be apocryphal, just like the similar story of Karl Pressentin being a potential gubernatorial nominee until he suspiciously crashed his buggy into a snowbank, another of the neighborhood folklore collection. Minkler's three decades in the county had been packed with adventures and notoriety, quite a contrast from 1877 when he moved here from Seattle without any capital. Unfortunately we know little of Minkler's personality and character, other than a quote from an obituary in an unknown newspaper where the reporter says that Birdsey was "conservative, farseeing and shrewd, popular and friendly," and "The name of Birdsey D. Minkler will ever be associated with those of the sturdy characters who, with unfaltering courage and determination battled with nature in her swamp and forest strongholds, bringing order out of chaos, making fertile the waste places. To such as he the Northwest will ever pay tribute." Most of the rest of the obituaries are flowery and seem to canonize him as a saint. He was always profiled as being larger than life, so we hope that we will discover information or that others supply articles that will give more details of his day-to-day life. We have not read anything to deter us from concluding that he was a fine, intelligent man, who truly loved his wife and was devoted to his large family. His only public dispute was with Indians on his original Birdsview property. This photo was supplied by Minkler descendant Janis Rankin Knott of Wisconsin. 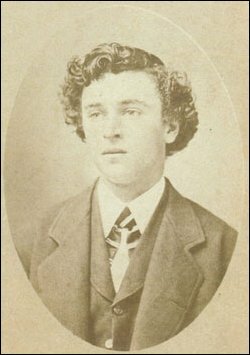 On the back is written: "Birdzey to California," taken at age 18, just before he left to join his mother in California in 1867. Thus, his given name could have been with a "z" instead of an "s," or this alternative spelling could have been a nickname. Coincidentally, has anyone noticed the resemblance between young Birdsey and "Dr. McDreamy" — Patrick Dempsey, of Grey's Anatomy? As '49ers furiously panned for gold in California, Birdsey Dwight Minkler was born on Oct. 9, 1849, in Omro, Wisconsin, a small town 20 miles west of Oshkosh and Lake Winnebago, and about 50 miles west of Lake Michigan. Family records record his father as Cyril Minkler, "a farmer and a descendant of a proud old German family who emigrated from the Rhineland district to Germantown, New York." The 1850 Federal Census of Winnebago County recorded the father incorrectly as Cyrus Minckler, with wife Mary A. and baby Birdsey as ten months old. We traced Birdsey's lineage all the way back to his (four-) great-grandfather, Killian Minckler/Minkler, who was born in Laubenheim, Germany, in 1673. That was the Rhineland-Palatinate (or Rheinland-Pfalz in German) district, which is now known as Bad Kreuznach. If you have ever visited that area of West Germany near the French border, you will likely recall the many castles and vineyards. By 1709, the poor residents of the district were reeling from battles with invading French troops and a disastrous harvest and many, including Killian and his wife, fled to Rotterdam and then to the beaches of southern England in 1709. There they stayed in huts on the beach while Queen Anne's government determined what to do with them. 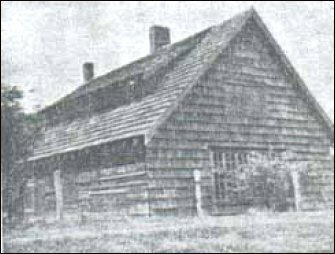 According to the history, Title to The Soil, Germantown, Anne proceded to buy back 6,000 acres in the New York Colony, from the manor granted to Robert and Alida Livingston, expressly for the settlement of German Palatines. That tract became the town of Germantown, and those who emigrated would manufacture naval stores for the government. Finally, the Mincklers were allowed to emigrate to New York in early 1710, and they soon settled in Germantown, now in Columbia County, near Albany and the Massachusetts border. The same history listed Killian Minckler in 1724 as one of the heads of families granted land by the provincial council. Mary Ann (Thrall) Minckler's lineage is much more of a mystery. In fact, her maiden name was spelled as Thradel in one family obituary. The only fact we know comes from the 1916 obituary of her second husband, which stated that Mary Ann Thrall was born in Fairfield County, Connecticut, Sept. 17, 1829. Cyrus Minckler and his father, David Minckler III, apparently moved to Wisconsin from New York in or by 1848 and Cyrus married Mary Ann in Wisconsin in 1848. David Minkler III was apparently the first of his family to move westward from New York state Wisconsin was "The West" in the late 1840s; California might as well have been at the end of the world. Killian Minckler was the original patriarch who moved his family. The lion's share of Minklers in the U.S. — who spell their last name in seven different ways — descend from him. Many of the present family descendants learned of their common lineage through the book, Minkler in America, which was researched by the late Robert A. Minkler of Montgomery, Alabama, and William Ward Minkler in the 1970s and early '80s. Robert was the eldest son of Garfield Minkler and a grandson of Birdsey. When Birdsey was just a toddler in 1852, his father and mother decided to join a wagon team and investigate California, which had been surrendered by Mexico to "Pathfinder" John C. Fremont the year they were married and became the 31st state when Birdsey turned one year old. When they reached the Platte River in Nebraska, Cyrus came down with cholera and soon died. Instead of turning back, his wife continued on to California and eventually sent for her sons, but only many years later, when they were adults. Meanwhile, Birdsey, barely three, and William, born in 1851 and still in diapers, were left behind and lived the next 16 years with Cyrus's father, David Minkler III, back home in Omro. Any time, any amount, please help build our travel and research fund for what promises to be a very busy 2010, traveling to mine resources from California to Washington and maybe beyond. Depth of research determined by the level of aid from readers. And subscriptions to our optional Subscribers Online Magazine (launched 2001) by donation too. Thank you. Thank you. Birdsey and his brother William attended the common schools of Winnebago County, Wisconsin, and after working through his teen years on the family farm, his grandparents sent him to a two-year course at Lawrence University in Appleton, Wisconsin. After completing the course he moved to Kansas in 1871 and two years later his mother apparently called for him and William to join her in northern California. Mary Ann had remarried on Oct. 3, 1853, to John D. Kelley, a blacksmith and miner, at Nevada City, Nevada Territory. That is now a ghost town in Churchill County, but they managed a hotel there for four years. By the time, she called for the boys, she and Kelley had settled in California at the small town of Janesville, 120 miles north of the site of the original 49er gold rush and 30 miles southeast of Susanville, a major market center. About 50 years later the gushing, roaring Susan River would be the subject of early drawings by American painter Jackson Pollock when he was growing up in the region. William settled in Susanville and Birdsey worked at a mill somewhere in the Sierra Nevadas, where he first noticed a teenager named Hannah Belle Chisholm who would become the love of his life. Hannah Belle lived with her mother, also named Hannah, who was married to her third husband. They resided in an Indian department called The Tules or the Tule Confederacy, just east of Susanville. Born Hannah Dixon (also spelled in the obituary as Dickson), the mother was a native of England where she was born on an estate near Newcastle-on-Tyne, where her father was steward. While married to her first husband, she had two or three children who all died very young and then the father died not long afterwards. She then married a miner named John Chisholm from Rexburgshire who moved her to Wales and then emigrated to Pennsylvania, sending for her after he went to work in mines here in the U.S. After his wife joined him, they had three children together, Hannah Belle being the youngest, born in 1856. The mother's health declined in the mining town and the family moved west when their daughter was starting school. After a short time in Utah, they moved to Gold Hill, Nevada, where John became a mining engineer. Within a few years later, John saved enough money to buy a ranch near The Tules with another miner named Stevinson Lax. After moving his family to the ranch in California, Chisholm returned to Gold Hill in 1870, where he was killed during what was called an altercation with another miner. Soon afterwards widow Hannah married a Mr. Lax. William Minckler settled near Susanville and lived there for the rest of life, retaining the "C" in his surname. Sometime in the 1870s, Birdsey dropped the "C" and all records in Washington state record him as Minkler. We have been unsuccessful so far in tracing Mary Ann's lineage. We found a hint when we discovered that the Susan whose name inspired the naming of Susanville — Susan Roop, married Alexander Thrall Arnold there in 1864, but we have never found a family connection between he and Susan. The Minklers move north to Washington Territory Birdsey and Hannah Belle married in Janesville on June 20, 1873, and they soon decided to move north to the timber town of Port Madison, Washington territory, where trees were cut to supply materials to build homes in California. The country had fallen into another cyclical financial depression that year but lumber was always needed, especially as immigrants arrived weekly in San Francisco on emigrant trains of the Union and Central Pacific railroads. Birdsey excelled quickly because of his native intelligence and education. This period of 1874-77 is only touched on briefly in Birdsey biographies, but we do know that Birdsey began traveling across Puget Sound by 1876 to the young village of Seattle, maybe because of the birth of his daughter Maude (at Port Madison, Sept. 12, 1874) and son John (same place March 30, 1876). Somehow he learned about the prospects of the upper Skagit River region. Perhaps he met either Jesse B. Ball or Winfield Scott Jameson, who soon set up logging camps of their own in the area around where the town of Sedro formed nine years later. Minkler discussed the Skagit area's merits with two newcomers at Port Madison that year who wanted to take advantage of preemption land laws, John Grandy and a German immigrant via Iowa, August Kemmerich. However they heard about it, Minkler was the point man and he ventured up to the Skagit River as soon as weather permitted in the spring of 1877, then portaged around two log jams near future Mount Vernon, and paddled and poled up the river with Indian guides until he found a piece of wilderness that had not been claimed by settlers, 50 miles from the delta. He was impressed with the fast-flowing river and the dense stands of timber that started right at the shoreline, and saw that there many food resources here which made up for the lack of trading posts for staples. At age 28 he was lean and fit after four years in the woods and he felt a boundless energy as he ran up the sandy beach and leapt over deadfalls and driftwood. 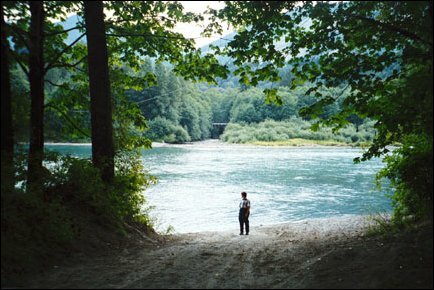 This photo was taken by Kemmerich descendant Barbara Halliday in 2000 as she looked south across the Skagit. Karen Halliday is standing where the old Pressentin ferry once landed and looking toward the old Karl von Pressentin ranch on the south side. You can see the bridge over Pressentin Creek on the south bank. He soon realized that he needed for his friends to join him so that they could help each other build cabins and carve out a niche. They soon followed him north. Historical Birdsview can be very confusing to those who are not familiar with the area. An area about five miles or more wide on both shores of the Skagit was known by that name and Birdsey is unique because he was identified with both shores. He preempted land on both the north and south shores but apparently built the family's first cabin on the south side, alongside the sawmill on Mill Creek. The future town of Birdsview, however, was only on the north side. Others were settling on the south shore at the same time, but he is father of the town itself. On Valentine's Day 1878, August Kemmerich staked his claim on the north shore, west of where Grandy creek emptied into the Skagit; Minkler had already staked his east of the creek in the year before. They would be squatters until surveyors could make their claims official in a few years after the land was surveyed. John Grandy staked a claim on the north shore, east of where William Hamilton was starting his infant village, and inland near a lake that would soon be named Grandy Lake. Very little is recorded about Hannah's feelings about this move to the hinterlands but she got her first scare in the summer of 1878 when they all had to huddle together on Birdsey's claim as Yakima Indians in full war paint paddled down the river in dozens of canoes to show their strength after a flare-up east of the Cascades. German brothers Karl (later Americanized to Charles) and Bernhard von Pressentin moved to the area also in May 1877. Bernhard staked a claim east of Minkler on the north shore and Karl chose a spot just upriver on the south shore from where Birdsey was building a primitive water-powered sawmill at the mouth of what is now called Mill Creek. George Savage, a surveyor and mill owner from Fir island, was also carving out a claim nearby Minkler's mill and moved his family up to join him in 1878. Savage noted in a memoir that "landing there one day while freighting (Minkler) showed me a claim which looked good to me. He offered me steady work so I took it." Grandy's historic record is very thin so we do not know if he was married at the time. In July 1882 he sold timber rights to his claim to A. Duncan and G.G. Wells in exchange for land in Kitsap County on the Olympic Peninsula, where he returned to log. The creek and lake, however, retained his name. In fact, because of historic notes that Kemmerich was Minkler's only neighbor, we wonder if Grandy was often away, logging on the peninsula. We do know that Kemmerich was still a bachelor, but within a year or two of arriving they all decided to form a wee village near Birdsey's home claim on the north shore, especially for the safety of Minkler's and von Pressentin's growing family. Birdsey and Hannah Belle added a daughter in 1881 whom they named Birdsey Annette. The village was originally known as merely Minkler's Landing for sternwheelers that could navigate that far upriver. Kemmerich soon named the village for his German friend, calling it Birdsview. Birdsey obtained a post office and became the first postmaster on Oct. 6, 1881. (That date comes from the 1973 book, Chechacos All; the 1906 Illustrated History cited the year 1880.) The village soon became the nucleus for all settlement east of Hamilton. Rockport and Marblemount were still a few years away and Sauk City was not yet formed. The only activity in the foothills of the Cascades up to that point had been that of prospectors and fur traders, with 1878-80 being the time of a mini gold rush another 50 miles upriver at Ruby creek, but that faded away. George Savage's son John was a noted artist and painted this view of the Minkler mill as if you were looking at it from Birdsview on the north shore. That is Mill Creek running through it and you can see a log flume descending from the hill behind. The cabin to the left may have been built by Minkler but was probably erected by George Savage after he bought the property in about 1886. Courtesy of Barbara Thompson and Dan Royal and his fine Stump Ranch website. The nearest settlement upriver was located where the Baker River emptied into the Skagit. Amasa "Pegleg" made a claim up there and miners John Rowley and Lafayette Stevens and settler Frank Hamilton and family would soon join him. Birdsey quickly became the natural leader of the upriver area and had the post office for everyone east of Hamilton as well as supplying milled lumber for cabins and eventually for houses. He maintained that role until moving downriver a bit in 1887-88, and then Karl von Pressentin became the political leader at Birdsview. The two Germans seemed to have gotten along well, but we see no relationship between their wives. Von Pressentin purposely played down the noble aspect of his family back home, although he did occasionally get loans or gifts from family members in Germany. The common assumption since then that he was a remittance man, however, seems to be off the mark. Frank Pressentin, a grandson of Karl, told historian John Conrad that his father logged ten million board feet of timber and most of it was sawed at Minkler's water-powered mill. The gold bug never bit Birdsey; maybe he had seen the futility of it all down in California. Although Kemmerich had been a coal miner for the Krupps industrial works back home in Essen, he apparently was not enticed by either the gold panned much farther upriver or the coal deposits near Hamilton that attracted Everett, Stevens or James J. Conner, cousin of the founder of LaConner. The latter town was still the destination to where they still traveled by canoe when they needed supplies that were not available in the infant town of Mount Vernon. The gold bug did take a bite out of Karl von Pressentin, who joined Otto Klement's party in 1877 when they first traversed the Cascades in search of the yellow metal that Indians had reported finding. Even after his wife, Minnie, and three young sons joined him at the claim in January 1878 he took another trip with the other argonauts later that year. But her hair-raising experience alone with the young children convinced her to lay down the law and hobble Karl so that he could hack out a clearing around their claim and build a safe and acceptable cabin. Meanwhile, Birdsey, milled lumber for nearby settlers at this water-powered sawmill on Mill Creek. Such mills were welcomed by settlers who often had to take a week off and paddle downriver and then across Skagit Bay to Utsalady, on the north shore of Camano Island, to obtain milled lumber. Ed. note: As we noted when we posted the original version of this story in 2002, this was the most complex story we produced since our original research of Sedro founder Mortimer Cook in 1993-94. Birdsey Minkler's story is one of the most important keys to understanding the settlement of the upper Skagit River wilderness and he was most important because he had such an effect on both sides of the river. In the spring of 2004, the Skagit Land Trust announced that they purchased the eastern portion of the lake and the adjacent property, including the land on which the tiny town of Minkler was once located at the southeast tip of the lake. Minkler descendant Mike Aiken informed us that his mother, Eleanor Aiken, still owns the western portion of the lake closest to the fork of the old Minkler Highway and Highway 20. The Skagit Land Trust has the mission of protecting this parcel just as they have protected nearby Grandy creek and Mill creek, which was the site of Minkler's first mill in 1978. We are sharing the information with them that we receive from you readers. In this first chapter of this story, you will read about his funeral, his early days in Wisconsin and California, his marriage, his move to the Olympic Peninsula and his settlement near future Birdsview in 1877-1884. The perseverance of the Minkler and von Pressentin wives was severely tested in early 1879 and the event would be seared in all their memories for decades afterwards. On Feb. 13, 1879, Minnie suffered an ordeal that would turn many a stout heart away from the wilderness. With only her husband in attendance, she gave birth to a baby boy in their primitive cabin in the middle of a storm. Then it was found that she was carrying twins. When hour after hour dragged on without the second baby's arrival, Karl and Minnie realized that they needed skilled help. Hannah Minkler was just across the river and she was 22 and had two babies of her own, but Minnie doubted that even that experience would prepare her for what was promising to be a troubled delivery. They decided that Karl would have to take her downstream to seek the help of a midwife in Skagit City, 30 miles down the river (about three miles below where Mount Vernon is today). Karl called his brother over to stay with the boys who ranged in age from five years old down to the newborn infant boy. Karl carried his wife to the river and placed her in a makeshift tent over cedar boughs that were stretched over two connected canoes sort of like a catamaran. They started on the long trip downstream during a storm and the boat required constant bailing. A north wind brought with it powder snow. Somewhere between Sterling and Skagit City, according to different stories, the second baby was stillborn. They proceeded downriver toward the midwife anyway and Karl was pleased to discover when they reached Mount Vernon that a sternwheeler was about ready to leave for Seattle. He took Minnie aboard and they stayed down south for a few weeks so that Minnie could recuperate and grieve in the company of city women. This is one of those instances when we wish we had a record of how Minnie von Pressentin and Hannah Belle Minkler commiserated about the sadness when Minnie returned home. The kids get a school and Hannah gets a great pick-me-up gift In December 1882, the Minkler prayers and concerns about their children's education were answered when George Savage's brother-in-law, Capt. L.A. Boyd, settled with his family south of the river where Boyd Creek now spills into the Skagit. As Alex Boyd explained, both fire and locusts drove them west from Neligh, Nebraska, where they boarded an emigrant train late that summer for San Francisco. Boyd had only been a landlubber for the prior 15 years. At age ten he stowed away aboard a sailing ship near Staten Island and started a nautical career that would take him around the world several times. But first a sympathetic captain made him a cabin boy and upon retiring took him to Paris, where Alex was taught classical subjects and the French language at the Sorbonne. He left the sea at about age 25, after the end of the Civil War, and rode on horseback from Baltimore across the plains, where he became a sodbuster and married Olive Clara Torrey who descended from a French-Canadian family. When the farm drove him batty, he taught at a small college in Nebraska. Soon after he began clearing his claim at Birdsview in early 1883, he and his boys — Archie, 12, and Jim, 10, helped other settlers build a schoolhouse where Alex would be the first upriver schoolmaster. Soon the school was filled with Minkler, Boyd, Savage and von Pressentin kids. We are unclear whether that school was near the Minkler and Kemmerich property north of the river or on the south side. That was the best news in a long time for Birdsey, who benefited from his education, and for Hannah Belle, but she still longed for a next-door neighbor wife with whom she could commiserate and chew the fat. By that time a hotel, store and saloon were built east of the steamboat landing, but they did not provide many social benefits for wives. Hannah Belle figured it was her turn for a present. Her spirits shot through the roof on the spring day that year when Bird's great friend August Kemmerich stepped from the steamer Glide onto Minkler's Landing, almost in front of her home, and turned and took the hand of his bonnie new bride. The 39-year-old German forest slayer had taken his first trip back East to visit old friends and met 25-year-old Miss Barbara Hommerding in Chicago, a second-generation German American whose parents emigrated from Luxembourg. They married on April Fool's Day in St. Michael's church in her hometown before a whirlwind honeymoon return in a first class Pullman car to San Francisco via the Central Pacific. We can imagine the non-stop chattering between 28-year-old Hannah Belle and her new neighbor and friend who lived just a shout, or clang of a spoon on a skillet, away. Birdsey was just as happy as he put the cedar siding on their cabin that was finally large enough for their four children. He milled the best heart-of-the-mill wood for his friend's honeymoon cabin next door. That year was the beginning of Hannah's deliverance away from gnawing loneliness in the woods. She had been given false hope the year before when August's uncle and aunt, Augustus and Theresa Kemmerich, joined August on his homestead and helped him develop it and build the two-story ranch house that would serve as the Kemmerich family home for many years. That inspired Birdsey to build a more substantial cabin on their claim next door on the north shore, working well into the evening after paddling against the current both ways to work at his busy mill. After getting used to having another woman next door, Hannah was crushed when Theresa announced during the winter that she had talked Augustus into moving downriver to Mount Vernon. After just one of those drizzly winters with icy wind roaring down the river canyon, she had had enough. Back during 1882, Birdsey showed concern for a fellow pioneer who was in search of a bride. Birdsey played cupid for Henry Cooper, who homesteaded a farm between Lyman and Hamilton. 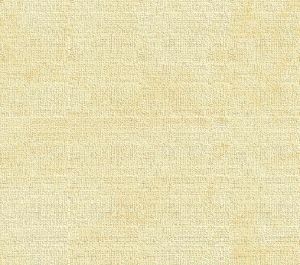 When Phil Bartlett mentioned that he had a sister of marriageable age back in Lawrence Massachusetts, Birdsey passed that information on to Cooper, who began corresponding with Clara Bartlett, a descendant of a Mayflower family. Ened Roughton, a descendant of the family, notes that Clara came out to Seattle in December that year and married Henry Cooper in January 1883. He died of a heart ailment five years later. 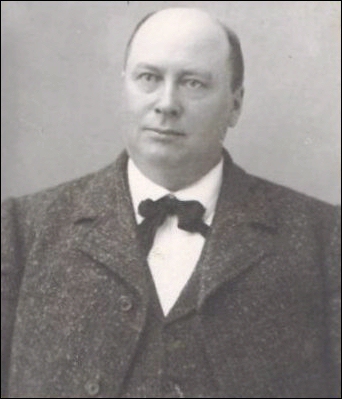 In the fall of 1884, Birdsey showed his political muscle when he ran for an at-large position of county commissioner for the new county of Skagit, which had split off from the original Whatcom County. He won easily and was the only county candidate to receive more than 1,000 votes in that election. Continue to Chapter 2 of the amazing Minkler story including: Birdsey loses part of his Birdsview land in a dispute with Upper Skagit Indians; he moves his family to Lyman in 1887 and builds another mill; Hannah becomes a society leader and then dies in 1893; Minkler Lake and town are named for the family and their third mill; the Minkler children marry and more about the mansion. In Issue 44 of the Subscribers-paid Journal magazine online we presented our two-part exclusive story on the origins of Lyman, including capsule biographies of more than two dozen early families. Also with photos never published before, through the kindness of Bud Meyers Jr. Lyman from the beginning and story of 24 families. Can you add more about these or other early families? Watch 2010 issues for profiles of Prevedell, Trueman and others. See the table of contents of the Subscribers-paid Journal magazine online, Issue 52, for a link to our exclusive story on Garfield Minkler's suicide. How Lyman was named and the very brief nearby village of Heffron. Section updated with four stories about Otto Klement, early Lyman pioneer who platted the town in 1887 and became its father. Updated in 2008 with the first known Klement photos through the kindness of Bud Meyers Jr. Links to five other Klement features, including his arrival here in 1873 after paddling across Puget Sound from Port Gamble. And see Issue 42 of the Subscribers-paid Journal magazine online for more stories from Klement's extensive diary. Lyman Tavern Fire of Feb. 9, 1950, and Cecil Hittson's memories of fighting the fire. See our portal section to the Upper Skagit River, with links to all the early towns and pioneers. Do you know anything about Cockreham Island, or the Cockreham and Cochreham families of the upper Skagit river? Or do you know of the Tingleys of Happy Valley/Day Creek? Do you have photos or documents of the early towns of Lyman, Minkler Lake, Hamilton, Rockport, Marblemount or Concrete, or of the Utopia district that we can copy? If so, please email us. Minkler, Robert A. and William Ward Miller, Minkler in America, published privately in 1979 and revised in 1983. This is the mother lode of information with great detail, from Germany all the way down to family members alive through the publication date. At the Seattle Public Library and the Skagit County Historical Museum in LaConner. Charts #62 and #78 specifically about Birdsey and family. The book is also in the research library at the Skagit County Historical Association Museum in LaConner. Correspondence with descendants Mike Aiken, Mary Lynne Ball, Al and Dona Rousseau, Robert Minkler, Tom Minkler, Deena Pittman Mullins, Judy Shoup and several others. Through the miracle of the Internet, we have also found Janis Rankin Knott, who is the great-great-granddaughter of Cyrus Minkler's sister and is helping us explore the family's Wisconsin roots. Jones, Henry Z., The Palatine Families of New York, 1710, vol. 2, 1985, pages 644-646 concern Killian's family. Illustrated History of Skagit and Snohomish counties, 1906, Minkler references: biography page 803, and notes on these pages: 119, 177, 178, 180, 246, 634, 811. Spencer and Pollard, History of Washington, vol. 4, page 765. Birdsey Minkler obituaries: (unknown newspaper) May 21, 1911; Anacortes American, May 18, 1911; Hamilton Herald-Recorder, May 20, 1911. Bellingham Herald follow-up stories May 22 and May 24, 1911. Hamilton Herald, June 1, 1893, obituary Hannah Belle Chisholm Minkler. Research conducted by Donna Sand of Bellingham. Skagit Memories; Skagit Settlers. Books of the Skagit County Historical Society series. Many photo features about upriver towns and pioneers, from Utopia to the Cascades. Our totally updated story of how Lyman was named for Dr. Lorenzo Lyman, a doctor from Helena, Montana. Do you know anything about Cochreham Island, or the Cockreham and Cochreham families of the upper Skagit River? Or do you know of the Tingleys of Happy Valley/Day Creek? If so, please email us.